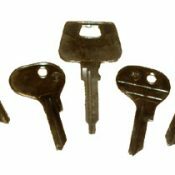 A key for Porsche cars manufactured between 1965 and 1995 cut to number or photo, except the Porsche 928. Models Include: 356A/B/C, 911 (all types up to ’95), 914, 912, 924, 944, 968. An emergency key for Porsche with laser cut keys, cut to the locks on your car. This key will suit most models from 1998 onwards. NOTE: This key does not include the transponder chip, and therefore will not start the engine. This will only open the locks on the car. Please contact us if you would like a key cut to key number. 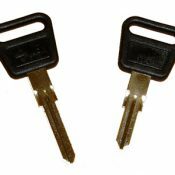 These keys are normally more reliable when cut to photo due to inconsistencies in the VAG key number database. A key blade to fit Porsche flip and non-flip remote keys, cut to the locks on your car. Models include: Boxster, 911, 996, 997, Cayman, Cayenne. A key to a Porsche 928 cut to number or photo. We do not use original blanks, we use high quality steel blanks manufactured by JMA. These blanks are very rare, and we only have a limited supply, so don’t miss this opportunity! 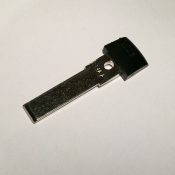 A single Porsche key blade, cut to a photo supplied by you. This key blade will fit a genuine Porsche remote key, so all you need to do is remove the old blade, put it in the new one, and the key will turn the locks. All Porsches with intelligent keys. 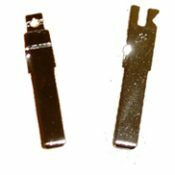 In order to cut your key, all we need is a photo of your existing key taken from above with the blade sharp and in focus. A key for Porsches with laser cut keys, cut to the locks on your car. This includes the transponder chip, which will need to be programmed to your car in order to disarm the immobiliser. 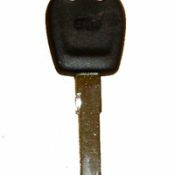 This key will suit most models from 1998 – 2004. Please note this key does not have the remote central locking function built into it.